Can you feel the love of hearts I have right now? but I am feeling the love for it… It’s the second heart blanket I’ve made and I’m still loving this pattern… although you do end up with a LOT of ends to weave in! Not exactly the most enjoyable part of crochet but well worth the effort when it produces a blanket full of hearts. 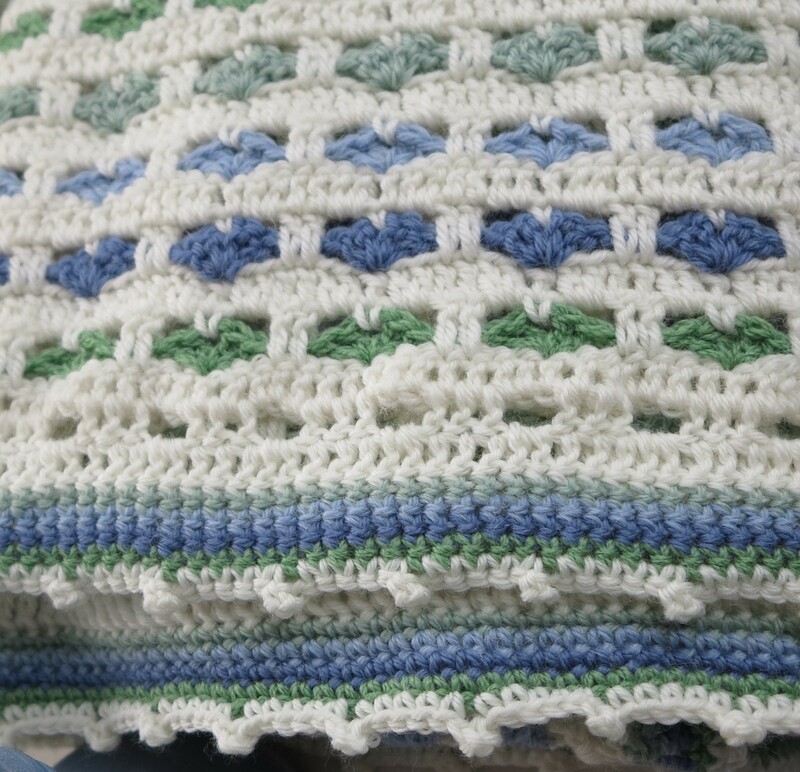 I finished the edge with a couple of rounds of single crochet in alternating colours, followed by my own little made up picot edge creating gentle little delicate curves. Well, I’m sure someone else has written a pattern like this edge, but I just sat there and played around with a variety of stitch combinations until I came up with this one. So, was it made up by me? Yes… Is it an original stitch combo? Probably not. But I had fun creating it. 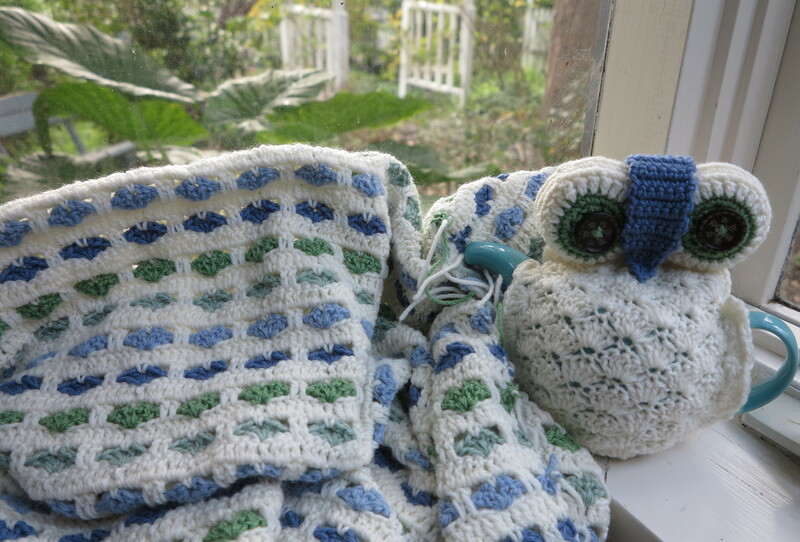 In fact I really heart making heart blankets – the colour and pattern combinations are endless. Ahhh, now to deciding on which crafty project becomes a reality next! I sense some pinteresting inspiration coming on…. All colours except the light blue are 100% wool. 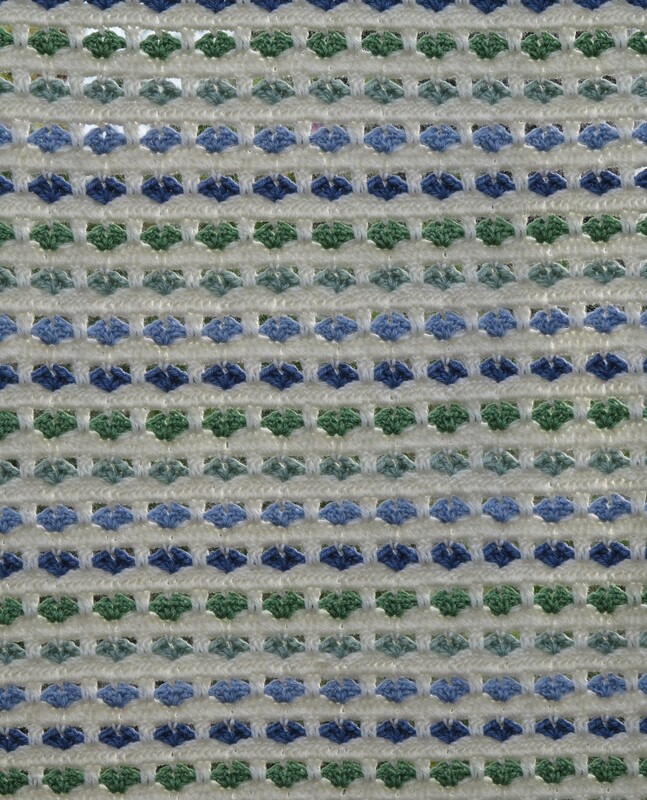 The light blue is 72% wool, 25% alpaca and 3% silk. Crocheted. Pattern details linked to in this post. 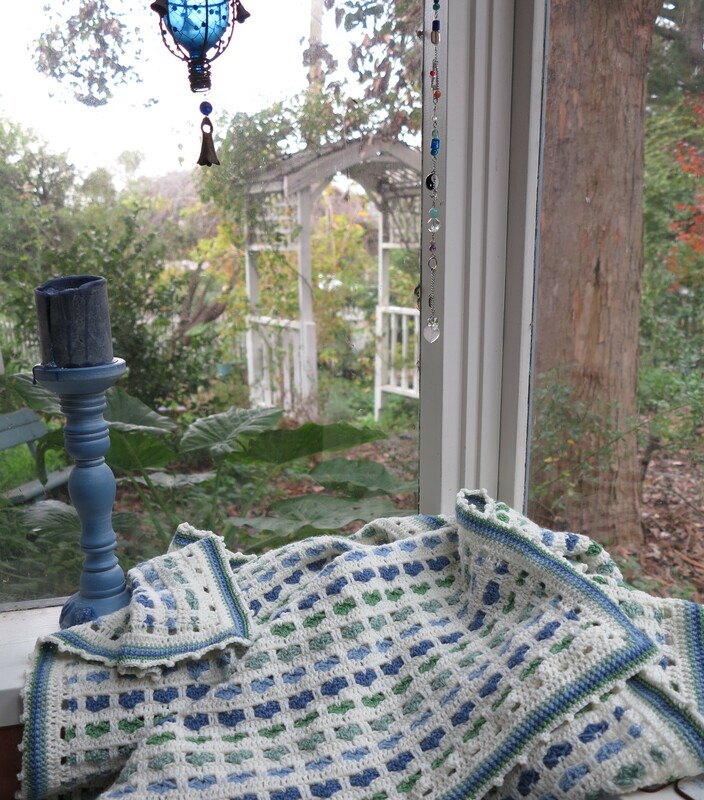 My knees will surely miss the warmth of crocheting this little number. Thanks again to Mother Nature for her colour inspiration! Green and blue look so beautiful together… I just love the way they play together, especially when creamy whites join in on the fun. The overall look is colourful, yet clean and light, and not too bright. 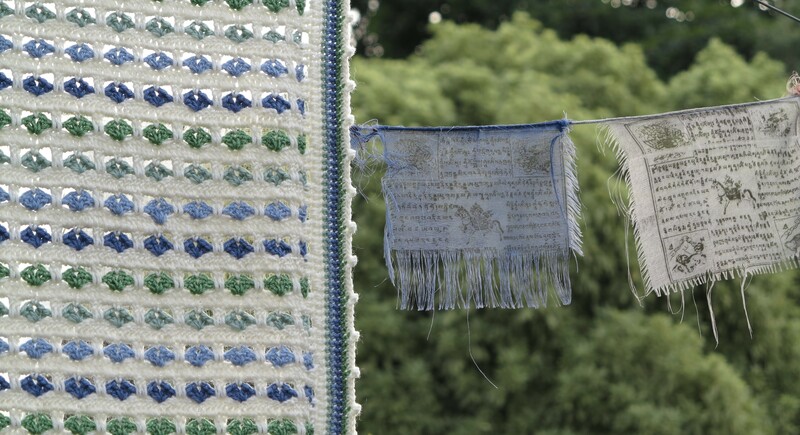 I love the frame effect that the one single crochet row of each colour creates around the border. And a little bobble edge goes a long way don’t you think? Hope your day is full of hearts too! 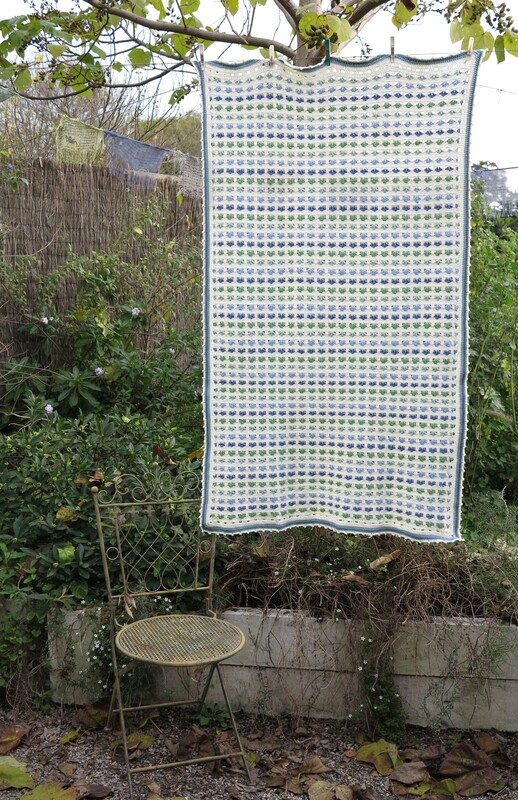 When I spotted this pattern I just knew I would be making one or two of these blankets…being that I love hearts and all! This is my current work in progress and will be quite the generous blanket… I’m still deciding if it will be a throw blanket size or a single bed size… Will see how much further the yarn goes. 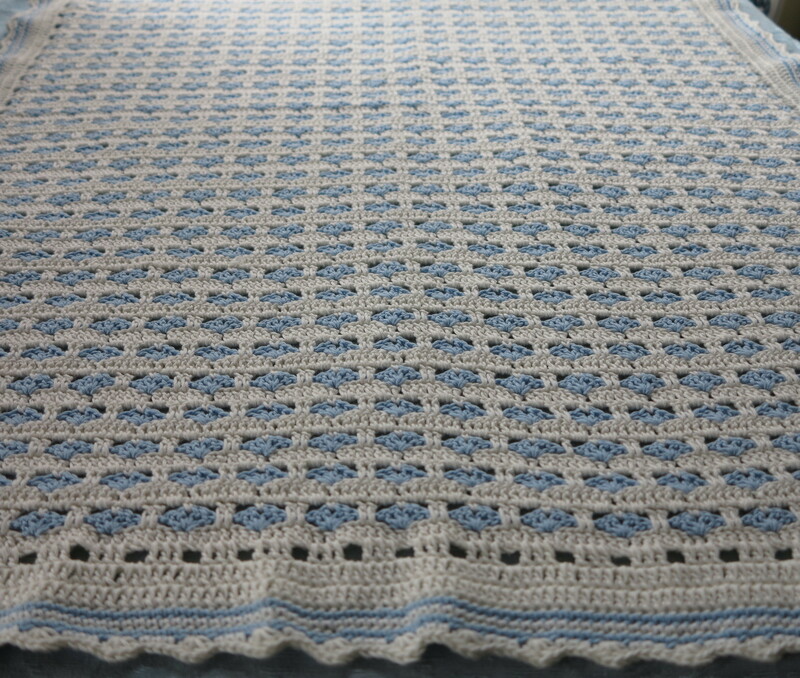 It’s all 100% pure wool except the pale blue which is an alpaca/wool blend. This is such a simple little pattern that repeats every 3 rows so it’s super easy to remember. In fact it’s so easy…..
…I decided to get another one on the go! 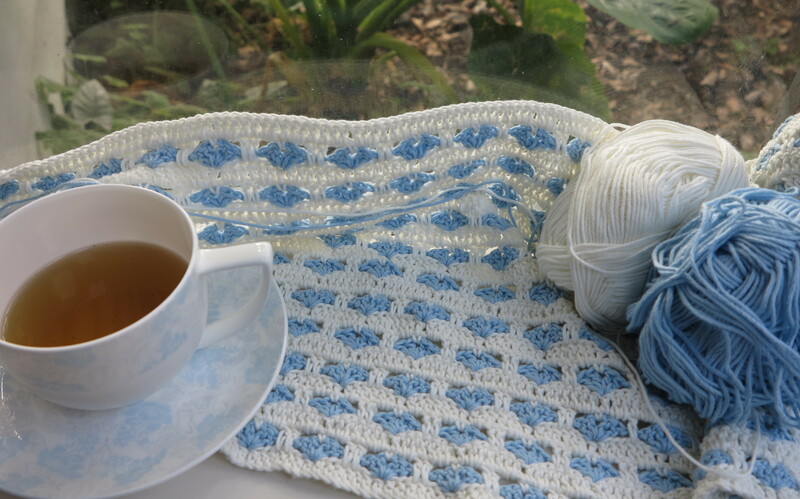 This one will be a baby blanket size and I’ve used the 90% cotton 10% silk blend yarn so it’s divinely silky to touch. I found the original pattern here via here. 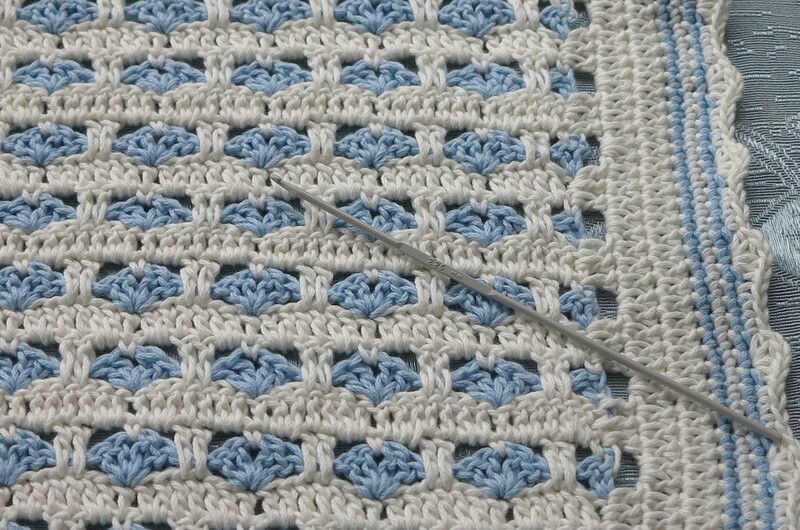 The second link is in Dutch but does give you the number of chain stitches required to make the pattern work in another size – most helpful I thought! Big thanks to Charlotte for this info. 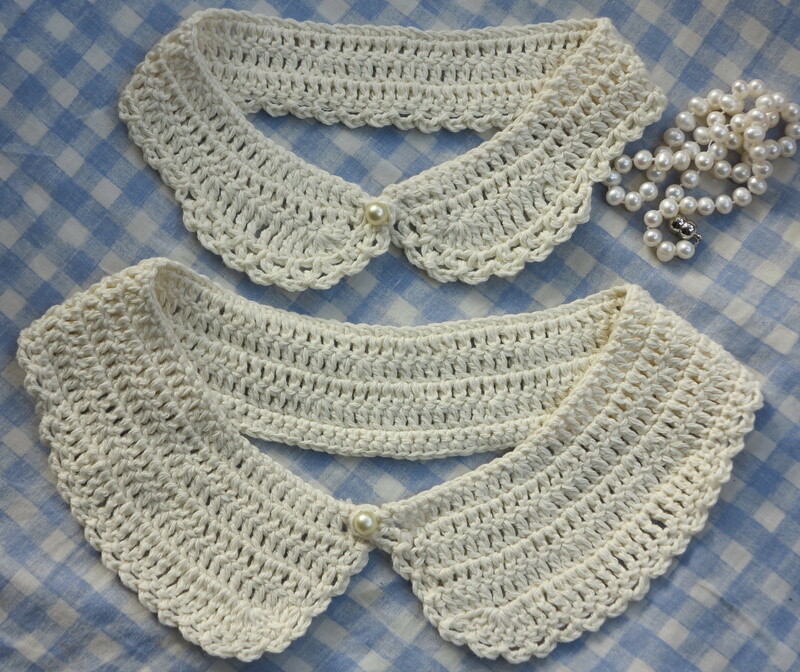 The only finished project in a while – and I only finished them as I needed to wear one last week for a Vintage High Tea with friends. A fun little dress up session with some dear friends where we also had our photos taken. 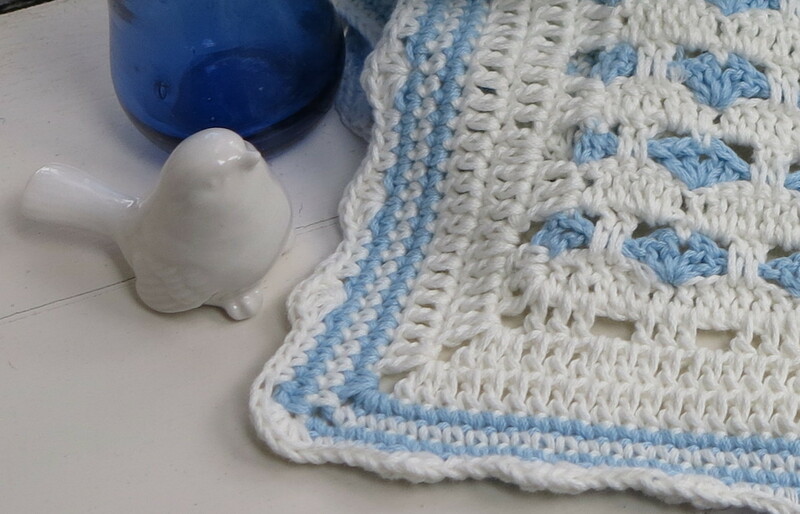 I cropped myself out of one and updated my ‘little white dove photo’ on the side menu… Gotta love soft lighting/focus. The Peter Pan collar went quite well with my little Victory Rolls effort. I found a pattern for the collar here but then added a little chain frill to the edge, doubling it up around the front curves. Then discovered this collar was too small and delicate for my outfit so I tweaked the pattern in a few spots and came up with the larger variety and just a simple single chain frill row. It wasn’t complicated at all and adapted quite well to a larger size. 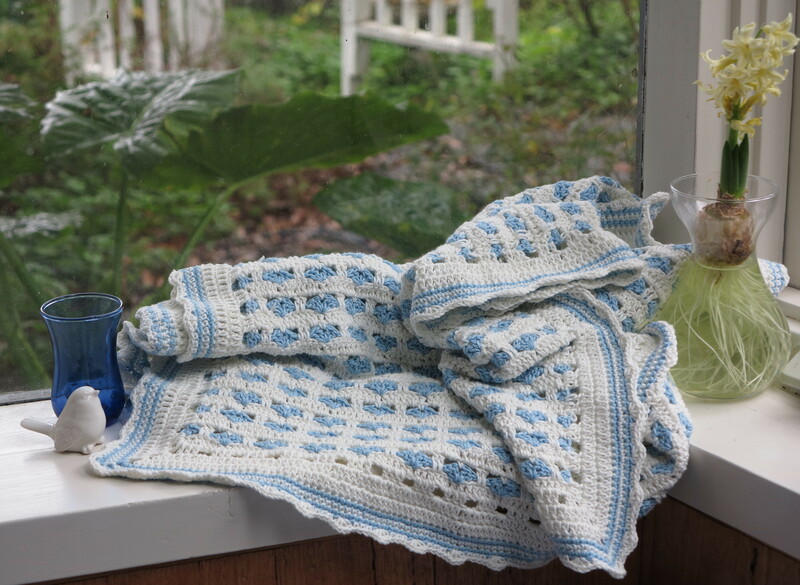 Big thanks to Shara Lamberth for the pattern.